Looking back on 20 years and looking ahead to 2018 Challenges. (above) NOMC Medical Director Dr. Cathi Fontenot educates New Orleans R&B legend Ernie K-Doe and his wife Antoinette about his alcohol-induced hepatitis. (below) Dr. Fontenot consults with a nurse at the Musicians’ Clinic. Dr. Cathi Fontenot, Dr. Jack McConnell (Volunteers in Medicine), several leaders from LSUHSC and Daughters of Charity, Johann and I first laid the groundwork for the New Orleans Musicians’ Clinic in 1997, we sought to overcome health disparity by providing comprehensive health care to a world-renown population of performers who had historically been excluded from the American healthcare system. 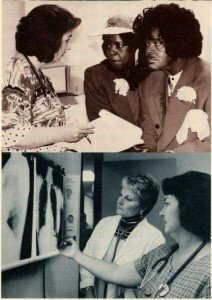 At the time we believed access to a world class brick and mortar medical clinic would overcome centuries of health disparity. In our founding year, we crafted an ambitious mission to keep this city’s musicians ALIVE in body, mind and spirit. 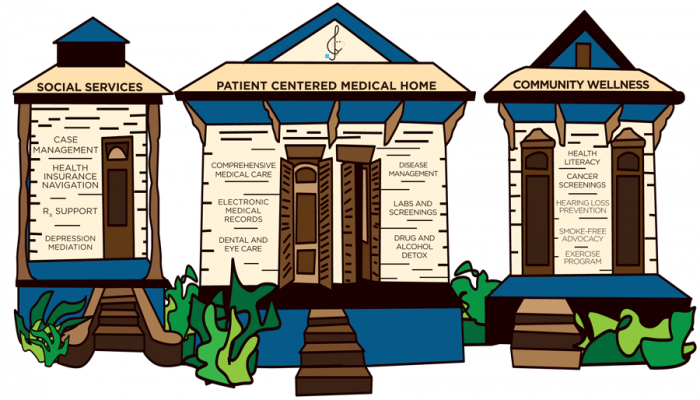 Over the past twenty years we have attracted the support of many dedicated partners, advocates and experts, who believe New Orleans’ culture bearers deserve life-saving primary care and wellness services regardless of their insurance status or ability to pay. Dr. Jack McConnell, founder of Volunteers in Medicine, crafted the NOMC with Johann Bultman to create a collaboration with LSU Health Science Center, Daughters of Charity, New Orleans Jazz and Heritage Festival & Foundation, and WWOZ. After twenty years of operation we have learned that to overcome health disparity we must truly prevent death by lifestyle. NOMC&AF’s first line of defense is enhancing our medical care with innovative social services, public health best practices, cutting edge medical research, and culturally sensitive community outreach. We have met many challenges and achieved successes in pursuit of that mission. In 2018 we enter our 20th year and perhaps our most daunting challenge yet: to sustain a vibrant population of performers amidst a drastically changing city and nationwide uncertainty surrounding health care access for the working poor. I ask NOMAF board members, providers, partners, supporters, and team members to become familiar with the new realities facing New Orleans’ performers outlined here and to engage in responsive NOMC&AF programming. To succeed in accomplishing our mission, we must understand and face these challenges – whether it be the tragic national epidemic of suicides which have touched each of us; the impact of the Air B&B debate on our NOMC patients and their ability to live in New Orleans, the shredding of the health care safety net NOMAF relies on, and upheaval in support services. We can only succeed in supporting the NOMC&AF mission if each of us is engaged to serve those bearers of New Orleans’ cultural traditions who depend on us. These tourists spent a record $7.41 billion. New Orleans’ cultural/service industries accounted for 37,793 jobs in 2016 – the largest employment source in the city. The second quarter of 2016 attracted the most visits (due to the New Orleans Jazz & Heritage Festival, & French Quarter Fest). Tourism is by far the city’s top industry, with cultural workers at the core of why visitors flock to our city. While the cultural industry booms, many performers must work one or more jobs (often minimum wage or cash-based service industry) to augment their performing income. In a survey of cultural workers, 42% said they chose work outside of the cultural industry to support their households. 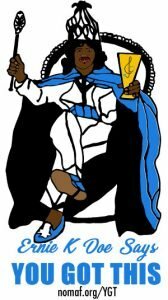 WWOZ’s Live Wire states that New Orleans’ 136 entertainment venues hosted 31,127 performances in 2016. During that same period, more than 3 million people attended 130 music festivals creating an economic impact of $904 million. The revenue created from these opportunities is mainly due to liquor sales, not shared with the performers who often must work for tips. As NOMC patients perform for tips throughout the year, many more play festivals that either don’t pay performers at all, or pay New Orleans musicians far less than out-of-town musicians. This reality creates a playing field where our “home team” musicians have to be on the road to make ends meet. Touring comes with significant health risks to individual musicians, including disrupting their continuity of care, sleep hygiene, nutrition options, and creating long stretches of time when they are away from their support systems. NOMC&AF advocates for economic equality for performers. NOMC social worker performs a needs intake for each patient which includes a financial assessment of living costs. As a part of our founding charter, we never ask a musician to donate their performance at NOMAF produced events. Louisiana has the highest healthcare costs due to statewide high rates in premature deaths, diabetes and obesity. With the highest death rates from cancer in the nation, 160 Louisianans die from cancer every week (American Cancer Society)- 30% higher than the national average. The mortality rate for African American Louisiana residents is 30% higher than their white counterparts. While Louisiana does not have a higher incidence of most cancers, we instead suffer from higher death rates (for instance, 24.5 Louisiana residents per 100,000 died each year from breast cancer, while the national average was 21.5 deaths per 100,000). Reasons for this staggering loss of human life include: late or incurable stage diagnosis of the disease and the long distances many must travel for treatment at a National Cancer Institute designated center. In a welcome but too rare piece of good health news, Louisiana Governor John Bel Edwards expanded Medicaid coverage and enrolled 350,000+ additional residents in the health care program. While Medicaid Expansion provides more individuals with comprehensive coverage, it did not add medical resources and providers to the state of Louisiana. Generally, there is shortage of quality primary care appointments available to Medicaid recipients, creating a bottleneck in services. Favorable health outcomes are dependent on the economic prosperity of the zipcode the patient lives in. As Louisiana continues to rank next to or dead last in USA health, poverty, and racial disparity indicators, our performers are impacted by these realities and depend on us to be their advocates. NOMAF strives to expand our provider network, mitigating this barrier to wellness for performers. In addition to the full time, reliable primary care at the NOMC, our partnership with LSUHN also provides electronic medical records, specialty referrals, same day appointments as part of an all-access medical system. A 2015 Mental Health America report ranked Louisiana 47th for overall mental health care, meaning the state has a high prevalence of mental illness and scarce access to care. In 2010, an estimate in the journal Psychiatric Services placed the number of psychiatrists in Louisiana at 200, with only 65 in the New Orleans area. Few of these practitioners accept Medicaid. Patients in the NOMC network remain in dire need of services due to increased prevalence of anxiety disorders and mental illness in creative communities. Performers are more likely to develop career-related substance abuse issues due to self-medication and currently remain 7 times more likely than others to commit suicide. NOMAF created the You Got This task force in August 2017 (launching its website in October) in collaboration with the Performing Arts Medicine Association and the Loyola Department of Music Therapy. The mission of the task force is to overcome the high suicide rate in our creative community by providing self care techniques and opportunities. In addition, NOMC seeks to expand its direct mental health services with the goal to engage 5 additional independently practicing mental health providers in 2018, and to partner with the LSUHN Department of Psychiatry, creating a center of excellence for performers. Many headlines incorrectly state more people are leaving New Orleans than arriving, although the most recent census states that the population of New Orleans has grown to 391,495. The influx of so-called “transplants” dealt a complicated and heavy blow to New Orleans’ creative community. There are 95,625 fewer African Americans living in Orleans Parish now than in 2000. Since Katrina in 2005, the New Orleans metro area lost 11% of its total population—the largestloss rate of the 100 largest U.S. metros. The average household size of the metro area fell from 2.59 to 2.52 over the last ten years. What is not reflected in these numbers is the influx of new city residents who are not invested in New Orleans’ historical cultural traditions. Those who once sustained musicians, Mardi Gras Indians and SAPCs are no longer here in large numbers. Simultaneously, the face of New Orleans’ performers has changed radically with what has been characterized as the “hipsterization” of areas such as St. Claude, Bywater, and Broad Street. We are now in a renaissance of actors, aerialists, comedians, dancers and musicians moving to New Orleans’ cultural mecca. This reality impacts our operation in two distinct ways: first, it means we must implement savvy health outreach around this new demographic of creatives, driving membership in the NOMC’s brick and mortar clinic. Second, as our NOMC patient population ages, we need to ensure they have resources to remain fully committed to our mission. NOMC social services must continue to provide social welfare to all patients, while NOMAF enhances national partnerships with support organizations such as Actor’s Fund, Dance USA, and others to sustain its unique healthcare offerings to younger artists. Bloomberg recently ranked New Orleans the worst in the nation in terms of income inequality. The economic breach between rich and poor in our city is massive, the largest in the USA. Median household income in New Orleans is $37,488, according to U.S. Census Bureau data. This gap between well-off whites and low-income African Americans is widening. 37% of households live in “asset poverty,” defined as not having the financial means to support a household for three months at the federal poverty level. Asset poverty becomes explicitly important during times of natural disaster, when savings and credit are ranked the most important reason individuals do not evacuate. According to an updated calculator of the Economic Policy Institute (EPI), a single parent with two kids needs $64,170 annually to achieve a “modest but adequate” standard of living in Orleans Parish. Their “Family Budget Calculator” was recently expanded to include housing, child care, transportation, taxes and other essentials for families with one or two parents and up to four children. For a family with one parent and two children in Orleans Parish, housing costs $12,016 annually (about $1,000 per month). Expenses for health care, taxes and “other necessities” add up to $64,170. The NOMAF Emergency Fund remains a lifeline for NOMC patients with a medical crisis. In 2017 we awarded more than $64,000 in payments to assist NOMC patients in times of medical and financial emergencies. The New Orleans metro area ranks 2nd in the top 10 worst metro areas for cash-strapped renters, according to Make Room Initiative. 37% of households in the city are paying half of their income for housing, much higher than recommended. New Orleans has only 47 affordable rental units for every 100 low-income residents. Within the NOMC patient and NOMAF client population our social services model is often their only life line in a crisis: be it a bike accident or terminal cancer. NOMC social services collaborate with local and national organizations for housing advocacy for our NOMC patients. The US Department of Justice reports that Louisiana has 2.8 million people in its criminal database. Please note: there are only 4.6 million Louisiana citizens. Louisiana incarcerates more of its citizens than any of the other 50 states at a rate at 2X the national average. Black residents of New Orleans continue to be disproportionately stopped and searched and more likely to be arrested for marijuana use than other residents. Gretna Louisiana, just across the Mississippi River, was recently cited as the arrest capital of the entire nation. With a criminal record it is difficult for our cultural workers to find housing or access to many vital services. The New Orleans Regional Transit Authority reported that 62% of pre-Katrina service has been restored. But Ride New Orleans, a transit rider organization, says streetcar rides targeted at tourists are fully restored but bus service for residents is way down, still only at 35% of what it was before Katrina. That may explain why there has been a big dip in the number of people using public transportation in New Orleans, down from 13% in 2000 to 9% now. NOMAF must ensure that the NOMC remains at LSUHN on St. Charles Avenue where it is easily accessible via public transportation. Through our United Cabs account, we continue to provide patients with transportation barriers rides to and from their medical appointments. The term “Food Desert” describes neighborhoods where fresh produce or healthy food choices are more than a mile from residents. These neighborhoods are usually saturated with convenience stores, liquor marts and fast-food that mainly carry processed food. Poor nutrition takes a tragic toll on our working poor. Cardiovascular disease, diabetes and high blood pressure are some of the health consequences associated with high obesity rate. An estimated 12.3% adults in New Orleans have a diabetes diagnosis, 40% higher than USA average. Access to healthy food is costly and many NOMC patients get their food at the Dollar General or $1 fast-food menus. Not having a full-service grocery store in neighborhoods ultimately costs those areas millions in “grocery leakage” –money people spend outside their communities on food. NOMAF programming offers free nutrition workshops at the Goldring Center every Tuesday night. We create handouts such as healthy eating after hours (in partnership with EatFit), You Got This foods to help avoid depression and top 10 healthy snacks for tour. In 2017 we engaged a behavioral health practitioner specializing in food addiction and continue to promote programs that double food stamp values when shopping at the Crescent City Farmers Market. The “Katrina Effect” is a sociological term in disaster recovery to describe the process by which original cultural narratives and social norms of a post-disaster region get overridden by recovery themes, language and culture. As an example, the $76 billion in assistance that flowed into to New Orleans after Katrina prompted the narrative that poor and working people residents were the primary beneficiaries of this funding. However, as we know post Katrina, it is clear those populations, received very little of that help. This constructed narrative bred crime, unhealthy living conditions and broken access to supportive services throughout the city. The cultural workers in the cash-based tourism economy bore the brunt of the Katrina effect disproportionately, and require the mission-driven support services NOMAF promised them as they have yet to make a full recovery from Katrina despite the cultural narratives. The award winning British documentary about the New Orleans Musicians’ Clinic provides a snapshot of what returning musicians endured as recent as 10 years post-Katrina. The film promotes the innovation of the NOMC model in the face of the disparity faced by the working poor of New Orleans, and offers a respite from dominant narratives which boast New Orleans as a fully recovered city. Be an advocate for your fellow musicians!